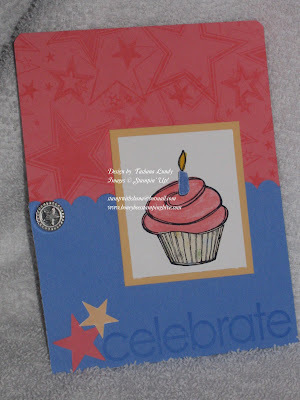 Today's project comes to you buy way of Stampin' Success magazine. What is that? Oh, that is a magazine published monthly by Stampin' Up! for demonstrators. We get all kinds of great tips, ideas, sneak peeks, and recognition from it. Contact me to join my team and start receiving your Stampin' Success magazine. Stampin' Up! has made it even easier to join by offering a 3 Easy Payment option for your starter kit. 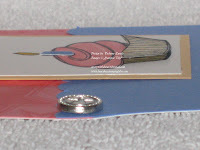 To make this hinge card I used Cameo Coral, Apricot Appeal, Ballet Blue and Whisper White card stock. The delicious looking cupcake is from the set Wagon Full of Fun. You can find that in the Occasions Mini Catalog. 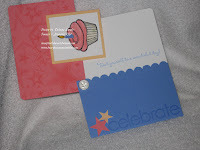 I used some Star punches and Star designer brad to embellish my card. Leave a comment I don't mind.